So you know I've been looking for a bag that could take my laptop and be pretty. The Strathberry wasn't really a laptop bag, so that didn't work but I had high hopes for my recent discovery: the Loretta from Danish bag designer RODTNES. I had jumped at the chance of ordering it at a discount and was eagerly awaiting delivery. When the box arrived I was not disappointed: well wrapped and packed (a box within a box), it emerged from its dustbag with that lovely leather smell. The zips run super smoothly and overall the quality looks great. Nice details and features such as adjustable shoulder straps and, as you'd expect from a laptop bag, a separate laptop compartment, that's roomy for even chunkier machines. 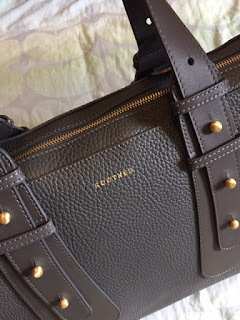 Other than that I could only find two things I could nitpick at: The zip has a leather pull attached that, due to its length, just sits strangely when the bag is closed. I would also prefer a slightly safer closure for the small outside pockets.